OpenNotes recently reached a new milestone: More than this number of patients can now read their notes securely online using patient portals. Ohio-based University Hospitals, with 141,000 patients registered on its portal, was the system to push OpenNotes over the 20 million mark. According to ICD-10 data collected by Amino, a San Francisco-based health care transparency company, in 2016, this number of people sustained injuries by walking into a lamppost, 17,200 by walking into a wall, and 25,500 by walking into furniture. The NotPetya cyberattack that shut down Nuance's health care transcription services for more than a month cost the company this amount in revenue during the fourth quarter of 2017. Nuance Executive Vice President and CFO Dan Tempesta estimates the company will continue to feel the effects on revenue in 2018, projecting an impact of $60 million to $65 million, according to FierceHealthcare. 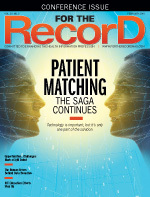 Rochester Regional Health, an integrated health care delivery system serving Western New York and the Finger Lakes region, has used its Epic EHR system to reduce its central line-associated bloodstream infections rate by this percentage over the last two years, according to Health Data Management. By selling this number of shares valued at $70, Cerner Corp President Zane Burke recently sold $3.5 million in stock, reports the Kansas City Business Journal. Burke's sale represented 55.6% of what he owned directly and through his 401(k). California Attorney General Xavier Becerra, JD, announced a settlement in which Cottage Health System is required to pay a penalty of this amount and upgrade its data security practices following two separate data breach incidents in which the medical information of more than 50,000 patients was made publicly available online, according to the State of California Department of Justice. According to a Mercom Capital Group report on the HIT/digital health sector, global venture capital funding in the first nine months of 2017 totaled this amount, an amount raised in 586 deals compared with $4.2 billion raised in 463 deals in the first nine months of 2016. Venture capital funding in the third quarter of 2017 came to $1.5 billion in 227 deals—the most recorded in a single quarter since 2010. The top funded areas in the first nine months of 2017 were data analytics ($1 billion), patient engagement solutions ($686 million), mHealth apps ($549 million), telemedicine ($529 million), booking ($407 million), and mobile wireless ($407 million).